2010 has been a busy year! 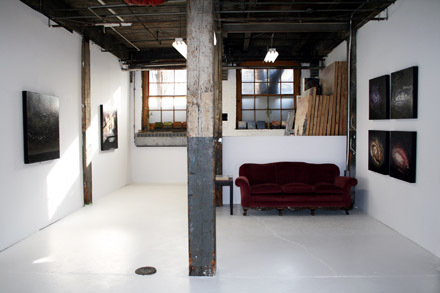 I transformed my studio at 401 Richmond St. West in Toronto into an exhibition space called Gareth Bate Art Projects which will periodically show solo and group shows. I had two solo exhibititions, Deep Field and Moments and organized the 401 Richmond Artists Open Studio event featuring 20 artists from the building. I completed a new photography series called Cumulonimbus which captures the shifting storm clouds over North Lake, PEI. Penance Performance was exhibited at the Royal Conservatory of Music at the Arts For Social & Environmental Justice Symposium. 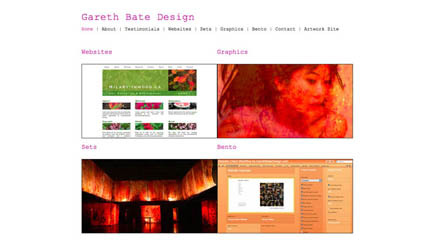 I launched my new art website and my first separate website for my design practice Gareth Bate Design. 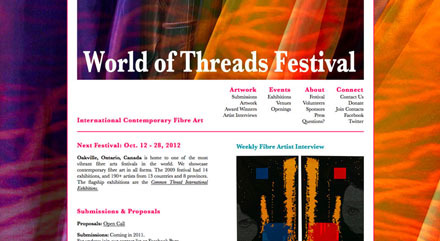 I remain actively involved with Oakville's World of Threads Festival. (Postponed) "Fleshed Out" a collaborative dance performance with David Pressault Danse and Shannon Litzenberger that deals with human/machine/cyborgs. 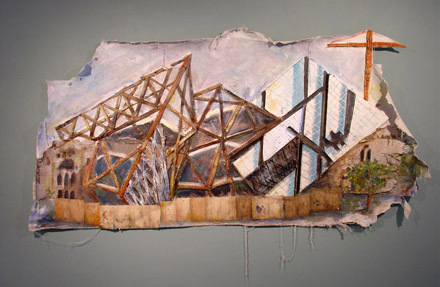 Coming December 2011:"Studio Detritus: Art Artifacts" I plan to curate a group show of beautiful objects from artist's studios. 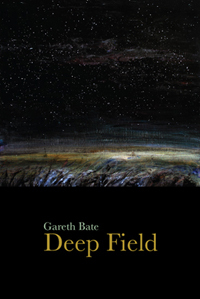 In December I exhibited my Deep Field series at Gareth Bate Art Projects. 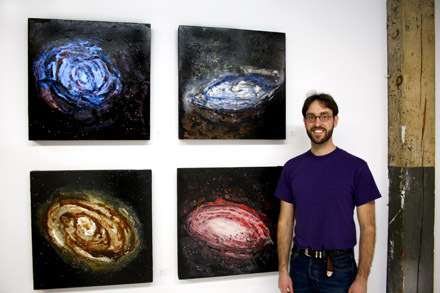 I've been struggling with this series of cosmos paintings for two years. It was eventually resolved by cutting the paintings into squares and reworking them. I realized they needed a sense of perspective for the viewer to observe the cosmos. I added a horizon line which made all the difference. 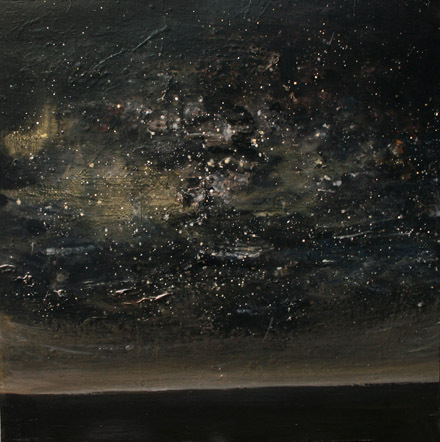 The series is a meditation on our scale in the universe and was inspired by the photograph known as the Hubble Ultra Deep Field which revealed the existance of billions of galaxies. In May I exhibitied my Moments paintings series at Gareth Bate Art Projects. The paintings depict vast open land beneath ominous stormy skies. These imagined landscapes have an intimate scale, only 8 to 10 inches square, yet they represent an epic space. Grouped together in sequences, they create a sense of shifting time and mood. I realized this summer that I've been shooting the exact same shot for 6 years during my yearly trip to North Lake Prince Edward Island. This body of work includes the photos from the last two years. I shot them all from the upper window of the house where we stay. They reveal the remarkable shifting weather conditions and storms. 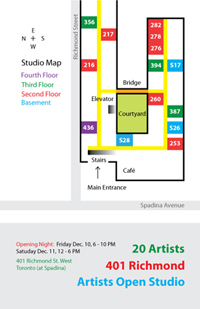 In December I organized this event featuring 20 artists from Toronto's 401 Richmond Street West. Each artist opened up their studio to the public for a Friday night opening and Saturday all day. The event was a great success and saw large crowds visit the building. My design practice has expanded dramatically over the last year. I continue to work freelance as a web designer. I specialize in artist portfolios and sites for professionals and creative organizations. I’m always taking on new clients. The World of Threads Festival, Howard Podeswa, Sarah Hunter, Hilary Inwood, and Jane Murdoch Adams. Cover of Ryerson Poetry Chapbook: "For The Infinite" by William Conklin, Ronald P. Frye & Co.
Art Square Gallery: Where They Are Now: OCAD Alumni Exhibition. Propeller Centre for the Visual Arts: Scapes, landscape painting exhibition. Part of my art practice this year has been to watch 52 critically acclaimed films in 52 weeks. I actually managed 65. I've followed lists such as "Critics Top 100 Films" and "Tiff's Essential 100 films". I figured I can't go wrong with the Criterian Collection! I often watch films while building websites to stay sane. 12 Angry Men, The Children's Hour, The Passion of Joan of Arc & Sketches of Frank Gehry. Picture: Nights of Cabiria, Federico Fellini. I'm actively involved with Oakville's festival of contemporary fibre art. I designed their new website and every week I publish a new "Weekly Fibre Artist Interview" with a local, national or international fibre artist. We are working towards the next festival in 2012. I continue to teach my course at Central Tech’s adult night school called "Paint The City". It is a lot of fun and I have a great core group of repeating students. I ask students to do on-sight photography and drawing which they bring to class every week. The next session starts Thursday March 24, 2011. Commerical Gallery: For the first time I will be persuing commerical gallery representation. "Studio Detritus: Art Artifacts": (Postponed) I will be curating a group show at Gareth Bate Art Projects of beautiful objects from artists studios. 52 Films in 52 Weeks: Part 2: I've already began the next round! I'm continuing to work my way through "great film" lists with a particular focus on documentaries. You will receive invites to future exhibitions & performances.